CFMOTO Powersports has partnered with Cycle Country to provide its dealer network with new options for aftermarket accessories on CFMOTO products. This will include ATVs and UTVs. Cycle Country is one of the world’s largest manufacturers of ATV and UTV accessories. Cycle Country has developed accessories such as Safari racks, tail gate extender, baja light bar, spare tire rack, snow plow mounts and blades for CFMOTO UTV and ATVs. These accessories will be available soon and distributed through the most popular parts distributors in the industry. Our company mission is to make high-quality products that help transform your favorite “toy” into a practical work tool without interfering with your ability to use your ATV for recreation. We strive to design products that can be mounted and removed quickly and easily. Cycle Country is known to be one of the world’s largest manufacturers of ATV accessories and has won numerous ATV accessory awards. In 1995 we extended our marketing efforts outside the United States and have since added distribution. CFMOTO, ChunFeng Holding Group Co., Ltd. was established in 1989 and is headquartered in mainland Hangzhou China. CFMOTO is known for producing high quality engines and drive trains, which all feature liquid-cooled, single cylinder technology, as well as fully automatic motorcycles. 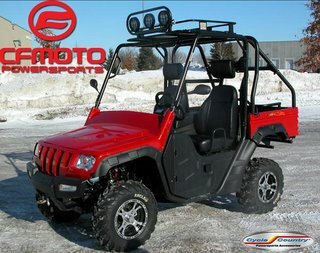 CFMOTO Powersports is headquartered in Plymouth, Minnesota and is the exclusive distributor of all CFMOTO products in the US. Consumers can purchase CFMOTO products through the 200+ dealer network in the US. Dealer inquiries are welcome.